Stock market investors are obsessed with forecasts, but how helpful are they? The concepts of forecasting are basically the same for stocks, bonds, and commodities. The forecaster takes known information from the present day and projects it into the future based on what they believe to be reasonable estimates. 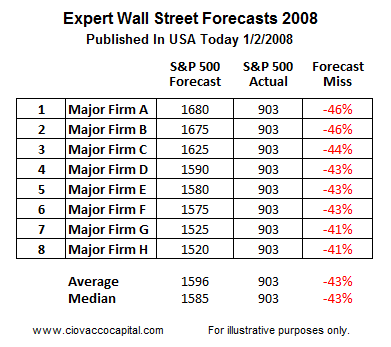 Since it can help us illustrate (a) the accuracy of forecasting, and (b) a better method to improve our odds of success, we will look at 2008 forecasts for the S&P 500 and the stock market’s subsequent performance. The horizontal lines on the chart below show 2008 forecasts for the S&P 500 that were published in the January 2, 2008 edition of USA Today; the title of the article was “2008 predictions for the S&P 500”. The forecasts ranged from 1680 to 1520. With the S&P 500 closing at 903 on December 31, 2008, the best forecast was off target by 41%, and the worst forecast was off by 46%. Did Major Firms Help In The Last Bear Market? 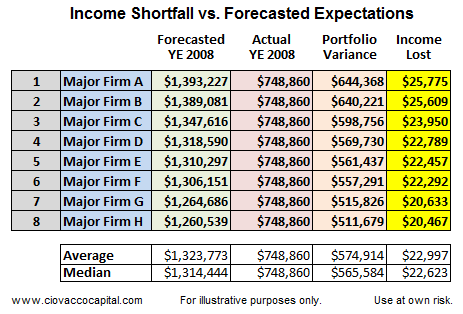 The table below shows each firm’s 2008 forecast according to USA Today. Forecasting is demanded by the public, which is why firms publish forecasts. Since we respect and understand the difficulty of forecasting, we refer to the firms in generic form in the table below. Our purpose is not to criticize, but rather to help investors understand the role forecasting should or should not play in their investment decision making process. In December 2007, a 54-year old investor is one year away from retirement. The investor has a $2M portfolio of which 60% is allocated to an S&P 500 Index heading into 2008. A 60% allocation to stocks comes to $1.2M. The investor is working with one of the eight major firms that had their 2008 S&P 500 forecast published in USA Today on January 2, 2008. The purpose of this hypothetical example is to illustrate what an investor expected to have from an income-generating perspective in retirement and what they had in the real world as of December 31, 2008, or one year later when they were ready to retire. If they were working with one of the major firms, their expectation was to earn roughly 10% on their $1.2M in the S&P 500 in 2008 (see green column below). Their actual return was a loss of 38% (red column). If we take the hypothetical example a bit further, we can estimate the negative impact on income during retirement. The table below shows the projected growth of $1.2M versus the actual growth in 2008. 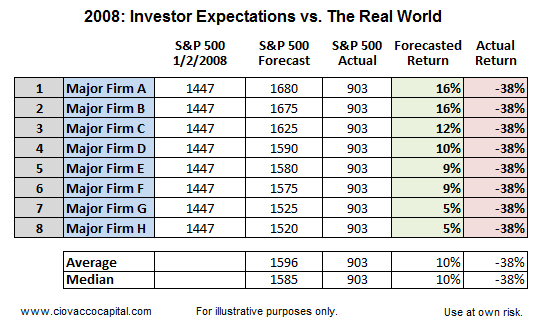 The most important column is shown in orange; it represents the shortfall of forecasted expectations versus real world performance. For example, in the first row, moving left to right, the investor expected their $1,200,000 stock portfolio to be worth $1,393,227 at the end of the year based on their major firm’s 2008 forecast. 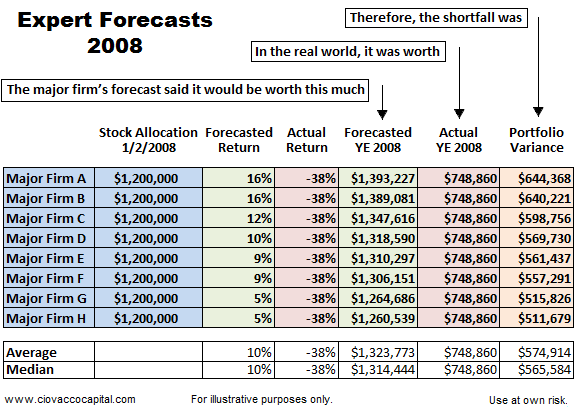 Still moving left to right in the first row of the table, in the real world their $1,200,000 was worth only $748,860 at the end of 2008, which represents a shortfall of $644,368 relative to forecasted expectations. If we assume our 55-year old planned to convert the S&P 500 portion of his/her portfolio into an income-producing diversified mix of investments that generate 4% annually, the table below shows the income they expected to have on January 2, 2008 that they did not have as of December 31. 2008. Mortality tables tell us our healthy 55-year old male retiree will live 25 more years; a female would live 28 more years. The median “income lost” in our example was $22,623 per year (see yellow column in table above). Therefore, we can estimate the total hypothetical impact on retirement earnings for a male and female (see table below). Is there a better way to manage/mitigate investment risk? Life is full of stress and uncertainty. Why do investors demand and crave stock market forecasts from Wall Street experts? Answer – it makes them feel better by adding a perceived element of certainty in a highly uncertain world of investing and retirement planning. 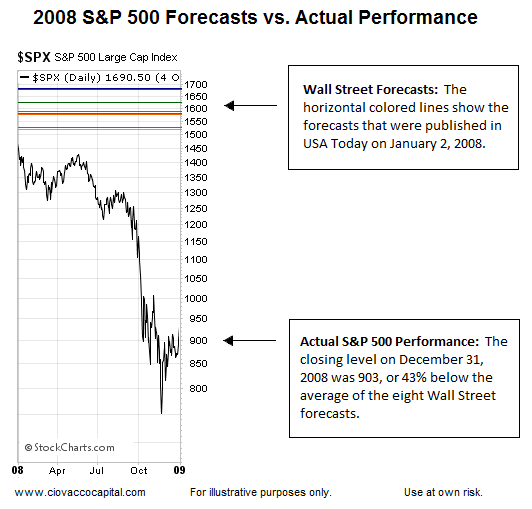 Just because it makes people feel better it does not mean stock market forecasts and predictions are particularly helpful, a concept that is clearly illustrated with the 2008 example presented above. Is there a perfect way to manage your investments and retirement plan? No, but there are numerous ways to improve your odds of success. More importantly, there are numerous ways to reduce the odds of making a major investment mistake, such as losing 38% in 2008. On June 22, in The Next Bear Market: How To Protect Your Assets, we walked through the worst part of 2008 step by step showing the probabilistic value of paying attention, rather than relying on forecasts. No one knew how bad 2008 would get…things changed significantly during the course of the year. We agree 100%. In fact, that is the whole point of the article. We live in a highly uncertain world. The financial markets have an almost infinite number of moving parts (valuations, central banks, geopolitical events, the economy, earnings, interest rates, terrorists, weather, natural disasters, speculation, etc. ), which makes financial forecasting extremely difficult and not particularly useful. Our purpose here is to highlight (a) that forecasting is not easy, and (b) investors should think twice before placing confidence in the value of investment forecasting. 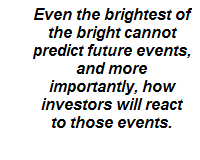 If an experts says “everything should be fine over the next 12 months”, the facts are even the brightest of the bright cannot predict future events, and more importantly, how investors will react to those events. 2008: What Did The Evidence Show On January 2? Are we saying if CCM published a 2008 stock market forecast (we did not) that it would have been more helpful than the ones referenced by USA Today on January 2, 2008? No, we are saying forecasting is difficult for everyone and every firm, including our firm. 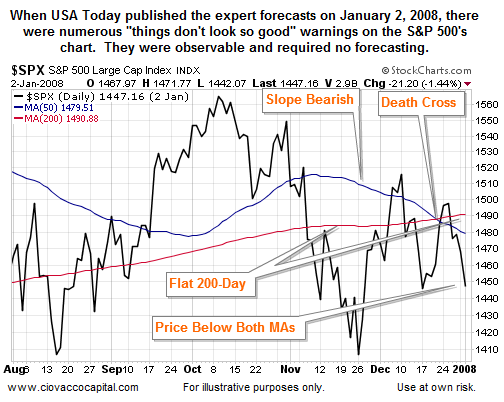 However, if a reporter called on January 2, 2008 and asked, “What do you think about the outlook for 2008?, we would have said “we are not big fans of forecasting, but the market looks vulnerable right now.” The vulnerable comment would have been based on the S&P 500 chart below dated January 2, 2008. The concepts used on the chart below are covered in detail in this 1987 video. Investment Implications – No Meaningful Change This WeekLast week, the S&P 500 was down 7 points for the week, meaning not much had changed. The chart of the S&P 500 below allows us to classify recent ups and downs as volatility to ignore. Therefore, it remains prudent from a risk-reward perspective to continue to hold U.S. stocks (SPY), leading sectors, including technology (XLK), and a relatively small position in risk-offsetting bonds (TLT). Next week brings a read on manufacturing (ISM) and the latest on the labor market (monthly employment situation). We made no changes to our allocations in the past five sessions. 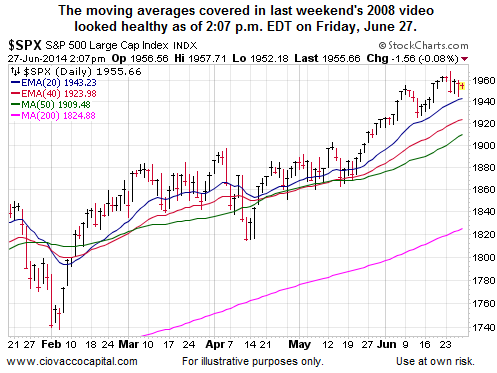 We will learn more next week seeing if the bears convert the recent stall into something more significant.